Mount any size camera on a tripod, erect the prompter on its stand next to the tripod, and just pull the hood over the lens. 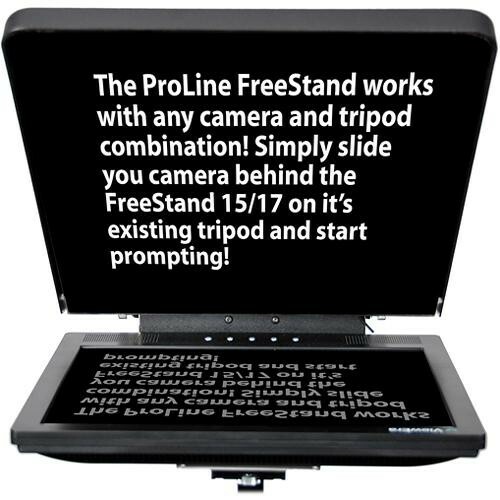 The Proline FreeStand 15" is a highly-adjustable teleprompter that allows easy, tool-less control of the camera and monitor. The monitor is self-reversing and can display text with the included Flip-Q Pro software (Mac/PC), or with any presentation software such as PowerPoint or Keynote. on a USB dongle that will let you move between computers without registering the application. You can also download the software for free and register it on your main computer. The Proline model of the FreeStand line features a 60/40 ultra clear beamsplitter adjustable to different angles.